1 What was the very last event to happen in the 1990s? It was an event people had to wait until after midnight on January 1, 2000, to see. The name given to the event was Y2K. And it all had to do with whether computers would be able to realize that a new century had begun. 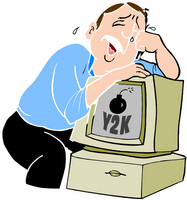 2 Y2K has also been called the millennium bug or the Y2K bug. The Y stands for the word year. The 2 is, of course, the number 2. The K comes from the Greek prefix for thousand, kilo. When you put these together, you get Year 2 Thousand, or the year 2000. 3 Computers have only been in general use since the middle of the 1900s. When the programs were created for these computers, the programmers didn't think much about the coming of the new millennium. Dates for computers were programmed into the computers using two digits. For instance, 1963 was programmed as 63. It was much more convenient and used less memory space to do this. Humans can distinguish dates stated this way easily. If someone told them that an event happened in 63, humans knew that the event happened in 1963. Computers aren't able to distinguish that, though. If information was entered into a computer about an event that was going to happen in 2007, the computer automatically assumed that the event was going to happen in 1907. 4 The first person to bring a possible problem with computer programming of dates to the public was a man named Bob Bemer. 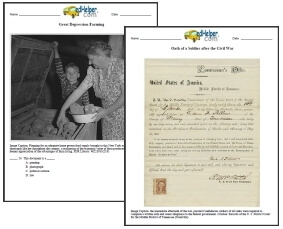 In 1958, he was working on a software program that would trace family histories, genealogies. For twenty years he tried to get other programmers to listen to his concerns. They weren't interested in listening. They were more interested in saving storage space in the computers and figured everything would work out on its own.